When evaluating a comic book, creators often look at writing, art, coloring and lettering. But design is a crucial and often-overlooked part of the final package. Recently, designer and writer Tim Daniel joined the Comics Experience Creators Workshop to discuss design principles, and ways of using design to tell the best possible story in the best possible format. Daniel is a noted comic-book designer, and has worked with creators including Brian Michael Bendis, Robert Kirkman and Comics Experience alum Nick Spencer. He is also the writer of Enormous, an oversized one-shot scheduled for release next week from Image imprint Shadowline. 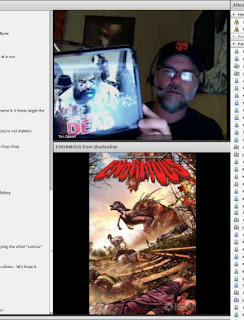 During the session, Daniel provided several pieces of fantastic advice, focused on using comic-book design to extend the story, and promote the creators' vision. Daniel noted that with some comic books, everything outside of the story itself -- from the logo to the indicia to the back cover -- feels like an afterthought. Instead, Daniel said, creators should aim for an immersive experience that carries the reader throughout the entire issue. Good design, he said, is a way of accomplishing that. By working with the creators' vision, Daniel said, you can extend the storytelling experience "from the logo all the way to the back cover," so that readers "have some sort of visual reward on every single page." Daniel cited Jonathan Hickman as a creator who is very design driven, and provides a front-to-back storytelling experience. "You can see his vision fulfilled on every single page," Daniel said. "It creates an immersive experience. You're not just going through it and thinking, 'I'll get past that credits page for example, and I'll move on.'" When designing a book, Daniel will often look at the characters, and try to find an "element" of them that speaks to him as a reader. As an example, he said that in Nick Spencer's Shadowline book Existence 2.0, the lead character is inhabited by another consciousness. So, Daniel sought to visualize that duality wherever he could. "The main character (Marco) has a great silhouette," Daniel said. "So I would add a shadow to it, and cast that shadow out from him. It's just a way to communicate to the reader that there was Marco, and there was the person inside Marco." When planning a cover, Daniel said that many creators simply aim to create something that's cool to look at. "Cool to look at is great," he said. "Cool to look at can probably sell a book. But something that tells the story -- that's worth pursuing." For example, he said, take the standard image of a character standing with two guns. "What if the guns are already smoking?" Daniel said. "Or what if the emotion on the character's face is something we see near the end of the issue. He feels remorse, or he's glad he did it. We won't know until the end of the issue why he's looking that way, or why the guns are smoking or who he shot." By thinking in this way, he said, "the cover becomes an extension of the story, not just something cool to look at." When creating a logo, Daniel said, he seeks to create "a really solid relationship between the logo and the art." Sometimes, he noted, that means he takes a minimalist approach that gets out of the artist's way. 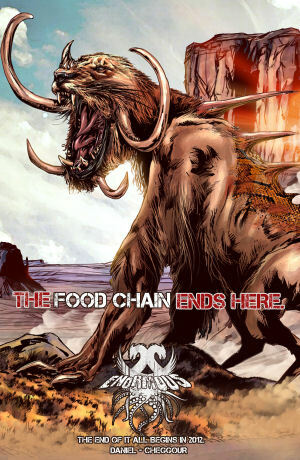 For example, Morning Glories features cover art by Rodin Esquejo. Daniel noted that "there's nothing that's gonna sell that book more than (Esquejo's) work." "However," he added, "there are books where the art sort of invites more of a graphic approach," Daniel said. "It may be whimsical, it may be haunting and kind of horror driven. I feel like there may be a little more latitude there." He said the choice often depends on instinct, and on the creators' vision. For those interested in seeing more of Daniel's work, Enormous is set for release on July 11. 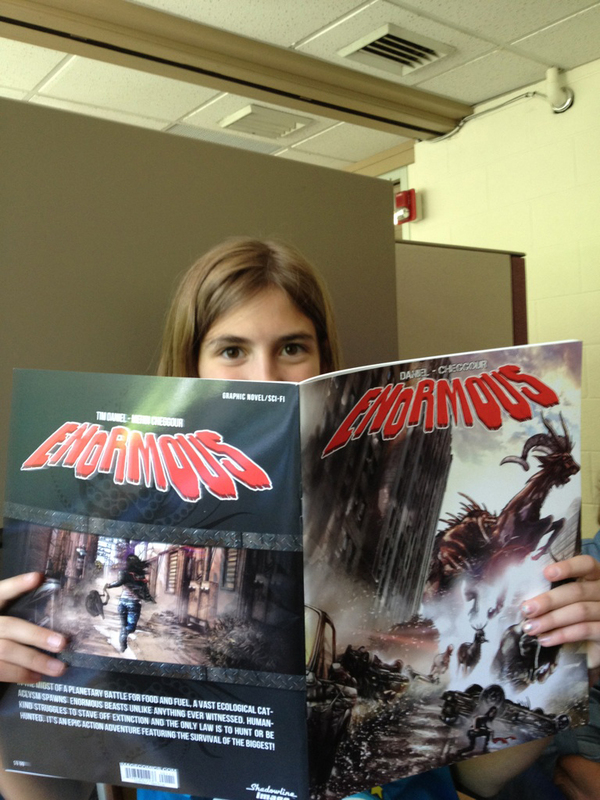 With art by Mehdi Cheggour, Enormous is a 64-page, oversized treasury edition one-shot from Shadowline/Image.